It may come as a surprise to some that rolls aren’t a very popular form of sushi in Japan. Limited in scope to a few classics like kappa maki (cucumber), tekka maki (tuna) and this negitoro maki, most people eat rolls when they’ve eaten all their favorite nigiri sushi, but their stomach isn’t satisfied, and the bill is starting to balloon out of control. Luckily in the US we have a huge variety of rolls to choose from running the gamut from California Rolls to Caterpillar Rolls (compete with green stripes and two little antennae). 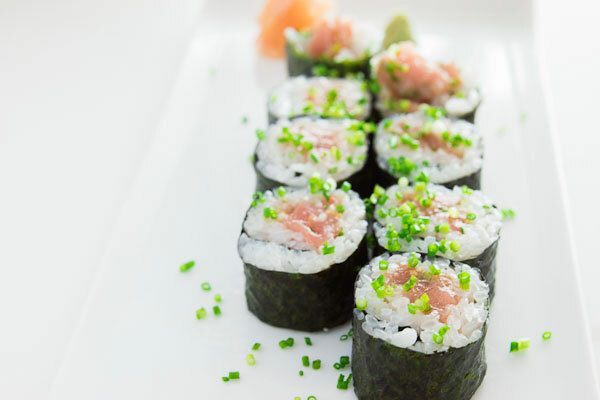 While there’s some technique that goes into making the rice and rolling it, sushi rolls are a lot simpler to make that you’d imagine, and they’re great for parties because everyone can chose what they want to put in their roll. 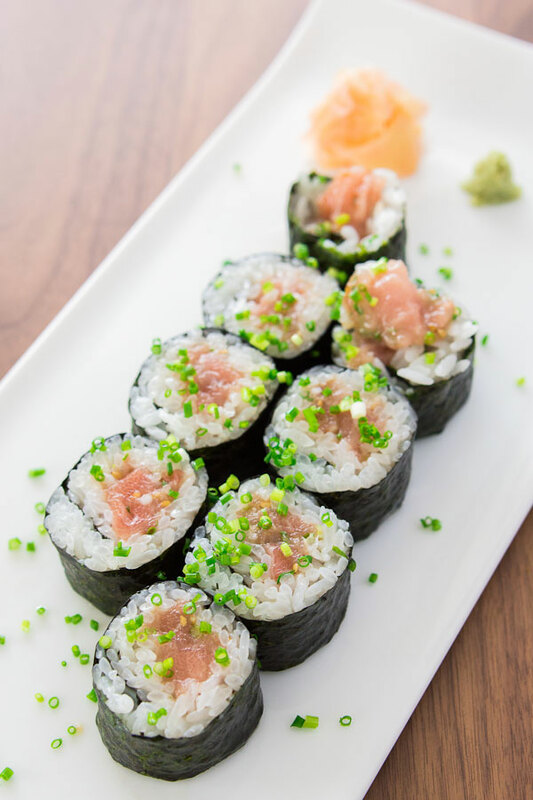 I’ve used a classic negitoro (tuna belly and scallion) roll to show you the process, but you can substitute anything you want for the filling to make you own sushi. One of the keys to great sushi is getting the rice just right. It needs to be sticky enough to hold everything together, but each distinct grain of rice should still hold its shape and glisten with the savory sweet vinegar it’s seasoned. For a more detailed step by step look at making sushi rice, check out my sushi rice tutorial. Negitoro is usually made by scraping the remaining meat off the skin and bones of the belly of a tuna, but since you probably won’t find tuna belly skin and bones at your local market, you can also make it by buying a fillet of ōtoro (fatty tuna), and mincing it up with a knife. 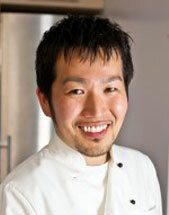 Follow Marc’s visual breakdown while you read his recipe below to make your own negitoro sushi. Follow Marc Matsumoto's step by step breakdown for making sushi in his post on the Fresh Tastes blog while you make this recipe for negitoro sushi. To make the sushi rice, wash the rice in a sieve until the water is almost clear. Drain and add to a heavy bottomed pot along with the water. Bring the pot to a boil, then cover with a lid and turn down the heat to low and set a timer for 15 minutes. When the timer goes off, turn off the stove and let the rice steam for another 10 minutes, don’t open the lid during this time. In a small bowl, whisk the vinegar, sugar and salt together. When the rice is done, dump it into a large bowl and cover with the vinegar mixture. Using a large spatula and fan, fold the vinegar into the rice while cooling the mixture with the fan. Keep fanning until the rice comes to room temperature. 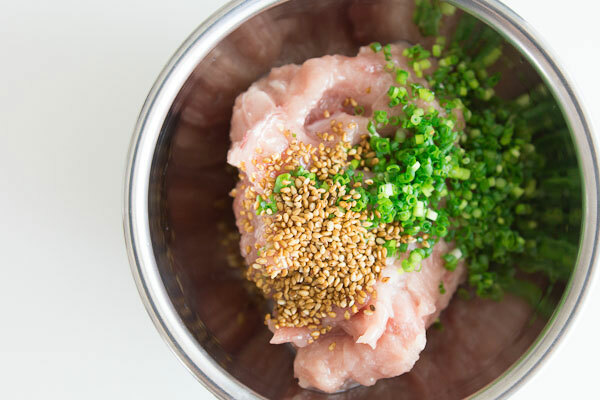 In a bowl, combine the minced ōtoro with 3/4 of the scallions and the sesame seeds and stir to combine. Prepare a small bowl of water to dip your fingers in to prevent the rice from sticking to them. Lay the nori, shiny side down on the bamboo matt. 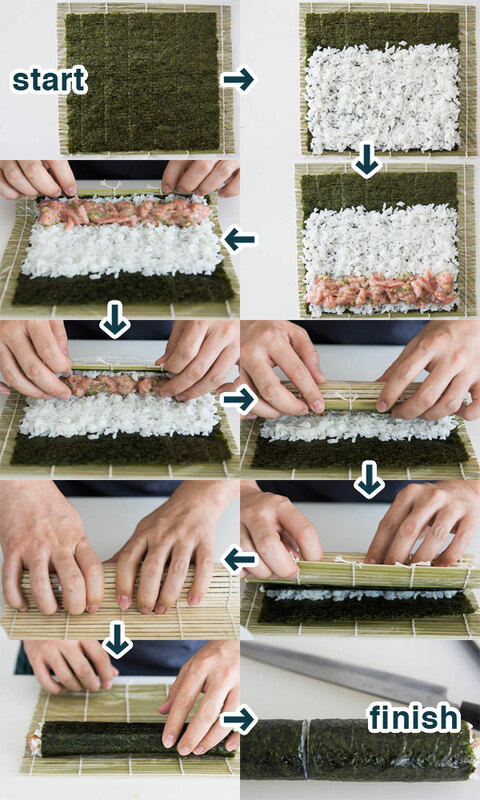 Wet your fingertips and lay down a thin layer of rice about 3/4 of the way up the nori. The rice will be sticky but just keep wetting your hands and gently press the rice outward with your fingertips to make it thin. Be careful not to overwork the rice or it will get mushy. Spoon some negitoro across the edge of the rice closest to you from one end to the other. Hook your thumbs below the bamboo mat and roll the edge up and over the filling. Don’t squeeze the roll at this point or the negitoro won’t stay in place. Continue rolling, being careful not to roll the mat along with the sushi. When you've reached the end, give the roll a good squeeze from all around to set the shape of the rice. You should end up with a slightly square roll. Using a very sharp long knife (a sushi knife is ideal), score the roll at the midpoint, then score the middle of each half, then score the middle of each quarter (you should have 8 segments). Follow these steps with a visual breakdown on the Fresh Tastes blog.